Hi readers – it’s been a long time! I wanted to share with you all some fresh-off-the-press research I published with colleagues at Bain & Company and partners at Google unpacking the drivers of slower adoption in online grocery shopping to-date and outlining three imperatives grocery retailers must address to take advantage of growing adoption and earn the loyalty of new-to-online-grocery consumers. Please check it out here: Omnichannel Grocery Is Open for Business—and Ready to Grow, published by Bain & Company in partnership with Google. Online grocery in the US is on the cusp of a major increase in consumer adoption, with e-commerce penetration expected to at least triple in the next decade. But online shopping is not yet consistently more convenient in the consumer’s mind; this convenience gap is limiting the broader adoption of online grocery shopping. Incumbent grocers have a rare opportunity to shape consumers’ digital habits and deliver higher levels of convenience through online grocery shopping. Digital tools are only just beginning to help address customer pain points and deliver the right marketing message at the right time, both online and in-store. The Food and Drug Administration (FDA) today announced courageous amendments to American nutrition label standards. The changes have already raised shrill responses from processed food manufacturers, which is an early and reliable signal that the new rules will benefit public health. The announcement is a thinly veiled acknowledgement by the FDA of a tectonic shift in public health protocol: dietary fat is not the killer we thought it was, and sugar has played a central role in our country’s epidemics of metabolic disorder, obesity, and chronic lifestyle disease. Make no mistake about it: these changes are a win for consumers and the free market. Free markets thrive in the presence of full information that facilitates unhindered choice. Under the old standards, manufacturers could easily obfuscate the amount of sugar in a product by: 1) not disclosing added sugars (makes people think that the sugar is “naturally occurring” and thus proportionally healthy); 2) presenting nutritional information for a “serving size” that represents a fraction of the contents of the package (e.g., showing the amount of sugar in an 8 oz serving of juice while selling you a 24 oz bottle). In addition to the sugar-specific changes, The Atlantic highlights the following as well: “’calories from fat’ will be removed because of the nature of fats vary. The labels will, however, still list ‘Total Fat,’ ‘Saturated Fat,’ and ‘Trans Fat.’” While there is still much public health guidance to be detailed regarding consumption of fats, this too is a brave admission that dietary fat and heart disease are tenuously linked. America’s era of fat phobia is easing as we become wiser and more scientific about the metabolic and physiological impacts of a long-chastised macronutrient. Bravo, FDA. In this depressing election season, this is good news from Washington that everyone should be pleased to chew on. The new Nutrition Facts label will include the following. An updated design to highlight “calories” and “servings,” two important elements in making informed food choices. “Dual column” labels to indicate both “per serving” and “per package” calorie and nutrition information for certain multi-serving food products that could be consumed in one sitting or multiple sittings. Examples include a pint of ice cream and a 3-ounce bag of chips. With dual-column labels available, people will be able to easily understand how many calories and nutrients they are getting if they eat or drink the entire package/unit at one time. It was almost two years ago when I stood staring at my backyard in frustration. The almost 3,000 square foot space had previously hosted several outdoor parties, bringing together hundreds of people over great conversation and delicious food. The backyard housed a prolific fig tree, a lemon tree, a kumquat tree, and a young olive tree. Staring at the those trees and a vast space of landscaped earth, I was inspired to put the dirt to work. Channeling my dormant vegetable gardener and fueled by a love of produce and learning new things, I found some friends and turned my backyard into an urban farm in San Francisco. Months later, I had a garden full of fresh vegetables, so much so that I didn’t need to shop at the farmer’s market and even had extra fruits and vegetables to share with my neighbors. Perhaps you’ve enjoyed dining at a farm-to-table restaurant, or even visited the farmer’s market to get some farm fresh produce to serve on your table. Now, inspired by my own backyard farm’s success, my new company, Foodscape, is bringing the farm even closer to your table. Foodscape enables people to turn their yards into farms and share the harvest with their community, just like I did with my own yard. Foodscape is creating a Neighborhood Foodscape in San Francisco – a farm made up of backyards, empty school gardens, and other unused land in the neighborhood. Everyone is invited to join and contribute land or procure some of the produce. Foodscape works like a very local community supported agriculture (CSA) plot. Once a minimum number of members join, Foodscape has an experienced “foodscaper” set up and maintain the farms. Members of each foodscape pay a membership fee – $350 per season (or $60/month for 6 months) to get a share of the harvest along with optional add-on local food items (eggs, meats, cheeses, dry goods, etc) from other local farm partners. Members can also sign up to attend Backyard-to-Table multi-course dinners made with ingredients grown within the foodscape. Membership fees are used to set up and maintain the foodscape throughout the season. In addition to delicious and healthy food, members get better acquainted with their neighborhood community. Learn more about how to start or join your own foodscape and get delicious, healthy homegrown food direct from your community, at www.myfoodscape.com For those of you in San Francisco, you are invited to attend an info session on Monday, February 8, at 6:30 pm at 381 Noe St. to learn more, meet your neighbors, and enjoy farm fresh treats. Contact me at mary@myfoodscape.com or 415-484-9749 with any questions. 2015. It’s hard to believe we’ve marked fifteen years in the new millennium. “2015” feels like that emblematic far-off year in a fantastical ‘80s movie. In that version of now, cars flew (or drove themselves? ), eyeglasses displayed our email (oh boy…), and entire meals came in pill form (just add water!). People and planet lived radiantly together. Only alien life forms could screw it up for us. We now shake our heads at many elements of that dated futurism. Perhaps we scoff most at the idea that fueling our bodies could be as simple as shrinking meals into a capsule. On the surface, not much about the way we nourish ourselves has changed in the past 30 years. Growing food is challenging (scaled indoor agriculture is still in its infancy); waste is huge; our health remains poor; and the war of hearts and minds is brutish (how do you get people to eat their broccoli?). Debate still rages between Slow Food and Silicon Valley; between PETA and Paleo. We haven’t cracked the code on the radical simplification of food. How fanciful, and how American, to believe in the cathartic simplicity of a pill. If only*. Nevertheless, the future for scaled, real solutions has never looked better. There is much reason for optimism as a number of tectonic shifts gather steam. Some elements of the food system (processing innovations, online distribution, the financial ecosystem) are changing relatively quickly, while others (the education of eaters and entrepreneurs, land use, federal policy) are morphing more slowly. However, the direction of progress throughout the Western food system is encouraging. And we all have a role to play in accelerating that progress. As we kick off 2015, let’s explore why. The modern history of nutritional science is sordid, indeed. Throughout that history, brash personalities gambled entire legacies on studies and hypotheses that masqueraded as high science, but were really imperfect guesses. Today, the broader population is beginning to coalesce around some of the major questions of diet and health. Excellent scientific journalism by the likes of Dr. Robert Lustig, Gary Taubes, and Nina Teicholz has laid bare the consequences of failed dietary conceits. We now know that the stealthy surge in consumption of metabolically disastrous sugar and processed carbohydrates has created a public health nightmare. We also now know that we shouldn’t have demonized certain fats: evolutionarily, they have always been an important plank of our nutrition, and the links between some dietary fats and both heart disease and weight gain were never as clear as we were made to believe. These are not middling realizations or fads: we are talking about a fundamental reassessment of the major constituents of the food that undergirds the Standard American Diet. Vegetables are becoming cool again. Portion sizes are becoming (slightly) more modest. Coke, Pepsi, and McDonald’s have experienced stinging contractions in their U.S. business. We’re in the grip of several revolutions in consciousness, layered atop one another. And those revolutions have already engendered dietary shifts that are shaking the foundations of the Western food industry. With more people seeking unprocessed foods, or at least scrutinizing ingredient labels like never before, there is unprecedented pressure on food processors. High Pressure Processing (HPP) has won enormous market share gains in bottled beverages (e.g., the “cold-pressed juice” trend), largely because it is not as destructive to nutritional integrity as pasteurization. Acidified foods are under review as they have been linked to increased prevalence of cancer and acid reflux-related problems. (Important note: not all low-pH whole foods – such as lemons – increase acidity in the body.) Sugar faces renewed investigation as an additive in 80% of foods in the center of our grocery stores. And chemical stabilizers are subject to greater consumer investigation than ever before. The net effect of all of this is an increased impetus on food processing innovation and greater demand for real foods, delivered cleverly. Food processors that can navigate the intersection of tastiness, health, and convenience will continue to be rewarded. A visit to a major natural foods trade show like Expo West (which had a record 67,000 attendees last year) confirms how many companies are trying to deliver on this promise, and how many eaters and retailers await them. Over a billion dollars have been invested into food delivery businesses by venture capital in the last 18 months. The traditional brick-and-mortar retail model is under pressure. Think about what this means for us eaters. Instead of relying on monolithic grocery chains to decide which foods are made available to us, we can increasingly turn to online distributors (many of them!) to pick precisely which foods we want delivered to our doorstep. An important bottleneck in food choice is being broadened. As we buy more of our groceries and meals online, our options will proliferate. Upstart products and brands will be able to grow more quickly than ever before. The aforementioned processing innovations will disseminate (and topple incumbents) faster than ever. This is an important spur for transformative food companies that otherwise might have toiled, cash-strapped, for many years to get a shot at a national presence. Now, a multi-region sales profile is not out of the question for a small food business that can navigate the new online sales platforms. This change is great for food producers and eaters alike. The food industry has myriad quirks and considerations that make entrepreneurship tricky. Thankfully, a collection of educational platforms has sprung up to help food founders learn how to build their businesses and mitigate risk. Local Food Lab has been holding startup workshops across the country. Food & Tech Connect has launched a suite of online courses. And the Culinary Institute of America has launched The Food Business School, a full-blown MBA-esque program for food entrepreneurs of all stripes. The combined impact of these programs will be a boost of rocket fuel to an already promising generation of food entrepreneurs. Food is a famously difficult industry for entrepreneurship. Because barriers to entry are low but growth is slow and painstaking, a large number of young food companies fail to progress beyond nascence. Achieving the maturity required to entice institutional investors has been the privilege of a very small fraction (perhaps less than 5%?) of food entrepreneurs. Yet today, crowdfunding allows packaged food entrepreneurs to finance their businesses in more sophisticated and low-friction ways than ever before. By spreading risk to more investors in bite-sized nibbles of capital, entrepreneurs are able to raise more money earlier, and are simultaneously forced to hone their marketing pitches. More – and better – companies will be able to thread the crowdfunding needle. The result will be better food products for us. As a case study that brings to life several of the above trends: I was a backer of Exo cricket protein bars on Kickstarter in mid-2013, and last week I was able to buy a case of Exo bars via an innovative new online retailer for health foods called Thrive Market. It dawned on me that Exo has achieved de facto national distribution, less than 18 months after launching via a crowdfunding platform. Five years ago, that would have been nearly unthinkable. In addition to the very public proliferation of crowdfunding platforms (micro-investment), large-scale financial shifts are changing the way capital is raised and deployed in the agricultural value chain. Billions of dollars of institutional capital from pension funds and endowments is flooding into real assets such as farmland and food processing. Given the long-term outlook of these investors, more and more agricultural producers are being asked hard questions about the sustainability of their operations. Water use, energy and environmental impact, the nutritive quality of food products, and labor rights are all under unprecedented scrutiny from large financiers. This is a big deal. The soil and our bodies will benefit. I recently had the privilege of spending an hour with Secretary of Agriculture Tom Vilsack. In that conversation, I learned much about the new programs the USDA has launched or is developing. The list of topic areas is impressive: bringing more young people into farming careers; soil and water health; climate change risk management; sustainable land tenure policy; and food waste reduction. Given that the federal government underwrites over $200 billion in loans to the rural economy every year and channels millions more to farms through grants and investment in R&D, it should give us all hope that the USDA is taking a progressive stance on the issues of the day. Let’s all pay attention to and support these programs, and lobby to ensure that they thrive in future political administrations. In many ways, it’s arguable that the “future” we longed for is already unfolding. The radical transparency of modern life has forced us to ask hard questions about our hard problems. Solutions to those problems have begun to bloom. Positive changes in the food system are real, synergistic, and persistent. As eaters, shoppers, investors, and learners, it is our responsibility to enable this evolution with our choices. We don’t need a magic pill. We just need us. *While we’re on that topic: I don’t believe Soylent is the “pill” we longed for. It merely modulates the fifty year-old nutrition shake concept, even if it is more scientifically formulated and more cleverly marketed. Soylent can sustain, but it does not nourish, and it does not supplant a real meal protocol. It is a stab at extreme reductionism in the face of an age-old challenge: what to eat, and how to get it? And let’s keep in mind that Soylent’s ingredients still come from plants. So do the ingredients of Hampton Creek, Impossible Foods, and Beyond Meat’s products. Horticulture remains the foundation of our food chain. And horticulture remains challenging. Aline first tasted acorns in her fifth grade classroom in Texas. After reading My Side of the Mountain (a classic children’s survivalist novel), her class cooked acorn pancakes. California natives can likely relate: making acorn meal while studying Native Americans is a universal California elementary school activity. (Acorns were a crucial source of calories for native Californians. The anthropologist Alfred Kroeber estimated that >75% of native Californians relied on acorns for food on a daily basis.) Later on, after graduating from an MBA program motivated to create a food business, Aline visited an exhibit on acorns in Yosemite and was inspired. The seed for Mighty Wild was planted. Despite having the idea – to create artisan food products using acorns – Aline and her co-founder Mimi Brown still faced a great deal of work. 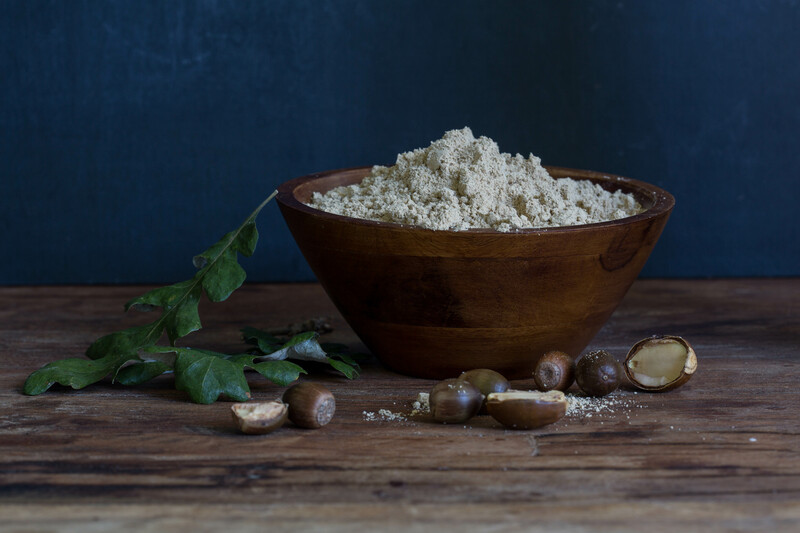 Specifically, they had to transform their raw ingredient into workable acorn flour, create a recipe for a food product, and build a supply chain from scratch. They spent months perfecting the process of making flour, first removing bitterness from the taste, and then milling the product into a fine powder. The founders then took advantage of Aline’s experience from the California Culinary Academy to battle-test dozens of recipes. They finally settled on their favorite creation: the acorn cracker. Their crackers highlight the nutty relish of acorns via three flavors: original, spicy chipotle, and rosemary & caramelized onion (my favorite). Acorn flour is naturally gluten-free, which positions the crackers in a very high-growth category. I see them as a high-end alternative to the gluten-free staple Mary’s Gone Crackers…almost Mary’s meets Rustic Bakery flatbreads, perfect for the sophisticated cheese plate. When tasked with securing a supply of acorns, Aline and Mimi had to start from scratch. Though wild acorns are abundant in the US and hold an illustrious place in our country’s history, there is no formal domestic supply chain. Acorns are currently eaten in other countries (as acorn jelly – dotorimuk – in South Korea, as liqueur in Spain) and are occasionally used domestically in high-end restaurants (chef Corey Lee of San Francisco restaurant Benu, just recently awarded three Michelin stars, featured a pasta dish centered around the oak tree and acorns – pasta made from acorn flour, jamón ibérico from pigs fattened on acorns, black truffles grown at the roots of oak trees). However there are currently no retail products in the US made with acorns. Aline and Mimi tracked down the current domestic sources for acorns and spent months formalizing their supply chain. This included defining their own guidelines for responsible foraging in order to minimize the impact on natural ecosystems. To ensure the continued health of domestic oak trees, Mighty Wild is collaborating with the Arbor Day Foundation to dedicate a share of their revenues to planting trees. With product and supply chain in place, the next step for Mighty Wild is to secure a sales channel. They’re currently in conversations with buyers at a major natural foods chain and, interestingly, were encouraged by a buyer to launch a Kickstarter campaign to prove demand exists for their products. It’s amazing to see that within just five years Kickstarter has become an accepted means of validating consumer demand, even for a national chain. We can’t wait to see Mighty Wild on shelves everywhere! Note: This is the second post covering takeaways from The Mixing Bowl’s June 20th conference on Food IT: Soil to Fork. 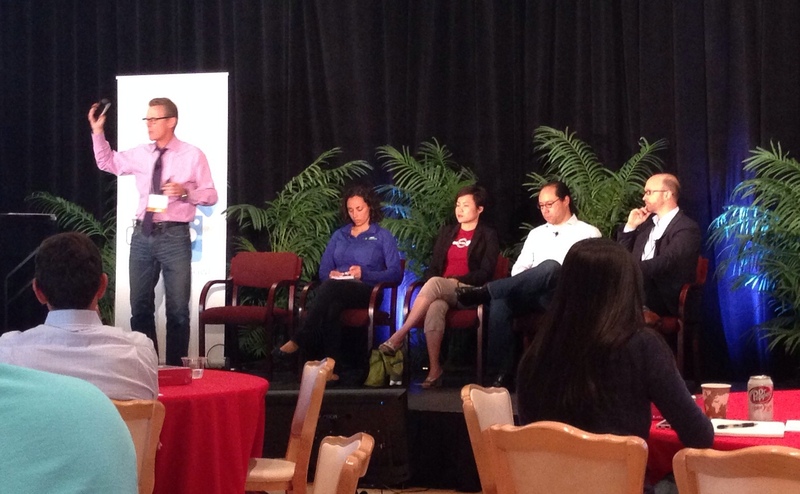 The first post focused on Pantry Labs and the potential for smart refrigerator technology. A particularly interesting afternoon session at the Food IT conference centered on the question, “How is IT being applied to the marketing and selling of food?” The panel addressed the full spectrum of steps required to bring a new food product to market: product conceptualization, formulation, customer testing, design, packaging, and scaling. Given the work I do for my day job (management consultant at Bain & Company), I have significant experience in the customer research step of the process and am therefore intrigued by opportunities to make the customer research step quicker (and cheaper) through the use of technology and shifting market dynamics. Chris Cornyn kicked off the panel by describing the value DINE Marketing can bring to the table. His premise? Nine out of ten new food products fail. The majority of these products fail – despite being heavily researched and tested – because they “get the insight wrong.” That is, they gather data on customer needs, wants, and desires, but fail to understand the true driving forces behind those needs. [i] According to Chris, a brand needs to understand not just the most explicit functional consumer needs (i.e., the need for sustenance) but also the nutritional, emotional, social, and cultural needs that drive purchase decisions. But how can a company best do that? Until recently, the primary method for understanding customer needs was focus groups. Focus groups are a form of research in which a company recruits target customers, places ~5-10 of them in a room together with a trained facilitator (usually with a one-way mirror allowing for observation), and gathers qualitative data on the customers’ perceptions, attitudes, and beliefs towards a specific brand or product. In my day job, I’ve structured, organized, and attended focus groups for multiple CPG/restaurant brands. My main takeaways? They’re expensive, time-consuming to execute, and static (it’s a one-time shot to get the data you need; if you want dynamic reactions which evolve over time, you need to set up a series of focus groups, and with few scale-driven cost savings). As an example of the costliness of focus groups, I conducted one set of six groups across three US cities at a total cost of ~$45,000[ii] – not necessarily a significant cost for the big brands out there, but certainly a barrier to entry for smaller CPG start-ups. Based on my experience, I was particularly interested when Mark Brodeur from Nestle claimed that, “The days of focus groups are over. Now it’s about leveraging social platforms.” So, what options do brands have for gathering consumer research without costly focus groups? As another alternative to focus groups, Cornyn shared a lower-tech solution that still relies on the qualitative reactions of consumers without the high price tag (I’m assuming). DINE Marketing conducted a study on behalf of a powdered mashed potato brand using crowd-sourced iPhone videos. Participants were asked to answer a series of questions via video about their favorite powdered mashed potato product (e.g., What do you like/dislike about the packaging? How do you store the product?). These videos revealed a serious flaw in current packaging (hard to open, impossible to seal once opened) that allowed DINE to innovate and create something much better. The relative lower cost of this path depends on what a company like DINE charges to gather the data, but it certainly seems easier than executing focus groups (although you do lose the benefit of a group dynamic, which allows participants to build upon one another’s’ ideas). For brands, an attractive alternative to hiring consultants and marketers to conduct research is to get in touch with the customer directly. That’s a challenging task given that many consumers don’t see the value in filling out surveys for brands (and those that do are likely not a representative cross-section of a brand’s customers). 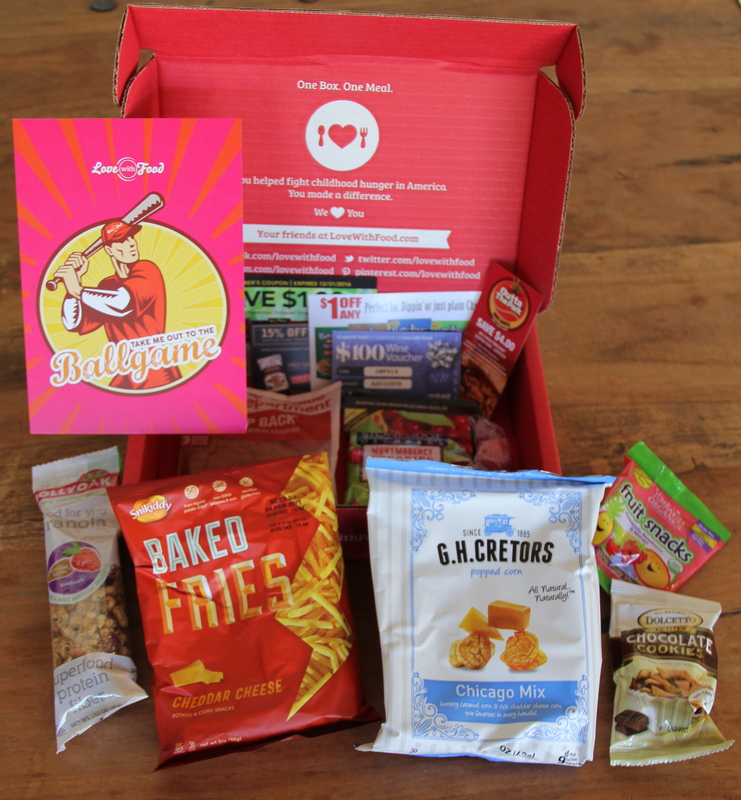 However, one food startup is making that connection much easier: Love With Food curates monthly boxes of natural and organic snacks and ships them, for $10 per box, directly to consumers around the country. Customers get to discover new and unique products each month, and also receive a handful of coupons and discounts for purchasing more of the featured snacks. Beyond making it easier for smaller food companies to gather customer research, Love With Food is focusing on another mission: alleviating hunger. For each box shipped or product purchased, Love With Food donates a meal to a food bank in the US. To date, they’ve donated over 250,000 meals. Good luck Love With Food! [i] One excellent example of the failure to understand people’s needs comes from my time at the Stanford Design School (d.school), which employs an empathy-driven design process. We were told a story about women in the developing world who spent laborious hours every day using stones to crush nuts into a fine meal. Western visitors to the community brought in a machine that crushed the nuts for them in a fraction of the time. Once the machine was in use, the visitors discovered that the women were miserable. The time-intensive process for crushing nuts had provided those women with ample time to sit with each other so they could talk and bond. The “laborious” act was at the center of an entrenched social ritual. By bringing in the machine, the visitors had “missed the point” entirely. Moderator: (~$10,000) A company typically hires a third-party trained facilitator with extensive experience leading groups (though larger CPG companies may have these people in-house). The moderator advises throughout the set-up of the groups (e.g., recruiting strategy and criteria, discussion guide) and is the point person shepherding customers through the desired topics. On Friday, June 20th, the Mixing Bowl, in partnership with the FEED Collaborative, held a conference entitled, “Food IT: Soil to Fork.” The event featured an impressive collection of speakers and food and agriculture startups. I’ll be sharing my takeaways from the conference via a series of posts this summer. Included in the day’s agenda were two fast pitch business plan competitions: one focused on food-related startups and the other on agriculture. The winner of the food competition was a hardware startup called Pantry. Pantry attracted attention throughout the conference thanks to the live demo of their sensor-driven smart vending machine, along with the delicious fresh-pressed juices they were giving out to bring their technology to life. What Pantry sells is a smart vending machine solution which enables the easy vending of refrigerated items. In sum: it’s a refrigerated kiosk which can be stocked with any sort of food (or even non-food) item, particularly exciting given it makes the sale of healthier fresher foods easier than it is today. A customer unlocks the fridge via his or her credit card, takes as many items as desired, and the fridge tallies the cost using radio frequency identification (RFID) tags to monitor the items leaving the fridge. Overall, Pantry offers a great value proposition for retailers and food service providers. It could also promote innovation by lowering the barrier to entry for selling products directly to consumers, by providing food producers a distribution alternative to pricey brick & mortar locations. I also am a fan of any technology that makes the distribution and sale of fresh foods easier relative to the inherent advantages of shelf-stable, preservative-laden, traditional vending machine fare. This could be a valuable technology to increase access to healthy foods in food deserts. However, what excites me most about Pantry is seeing RFID tags in action and envisioning their implications beyond retail vending: namely, smart refrigerator technology. 1) Data on food consumed: Over the years, I’ve been beckoned by the siren’s call of the quantified self – the idea that you could track massive amounts of personal data (your sleep, your exercise, your diet, your alcohol consumption, your mood, your day-to-day health) and run a giant regression to start to better understand what drives the day-to-day fluctuations in how you feel. A key input to that equation is food consumed, and to-date I haven’t found an accurate technology that makes tracking that input easy and passive. I once spent a summer manually recording everything I ate. It was exhausting and definitely not sustainable nor practicable for the average person, who I’d assume has far less interest in the topic than I do. I’ve always viewed the automated, passive collection of food consumption data as a holy grail of quantified self. Smart fridges don’t get you all the way there (since we consume plenty of food outside the home, and what goes in and out of fridge can be consumed by more than one person), but they would be a step closer to automated data collection. That excites me. 2) Data on food waste and spoilage: A topic that was addressed in a Mixing Bowl panel (and covered at length on this blog earlier this year) is food waste. As previously articulated, there is massive opportunity to improve our diets by eliminating the expense of wasted food and using the saved money to upgrade to more nutritious food. The average family of four throws away $1600 worth of food per year, which is a huge figure when compared to the estimated incremental cost to the same family of adopting a healthy diet: $2000 per year. One hypothesis for reducing the amount of food wasted is to increase consumer awareness of what’s actually being thrown out (and how much money could be saved). Smart fridges which utilize sensors to alert the consumer of food that’s soon-to-spoil and then tally the value of food which spoils could go a long way in increasing transparency around this issue and motivating behavior change. Pantry is aware of this opportunity and helps food vendors monitor and avoid food waste. Though food waste at retail is substantially smaller than food waste by the end-consumer (~13% of total food waste vs. 55%, respectively), there still is an opportunity to reduce waste. Via RFID tags, Pantry monitors the age of each item it holds and alerts retailers once an item has passed its shelf life. These data could help vendors make better decisions around how much to produce, how to stock aging food, and how to quantify food waste. For a more in-depth review of RFID technology to date, and the vision of the smart fridge, this article is a worthwhile read. 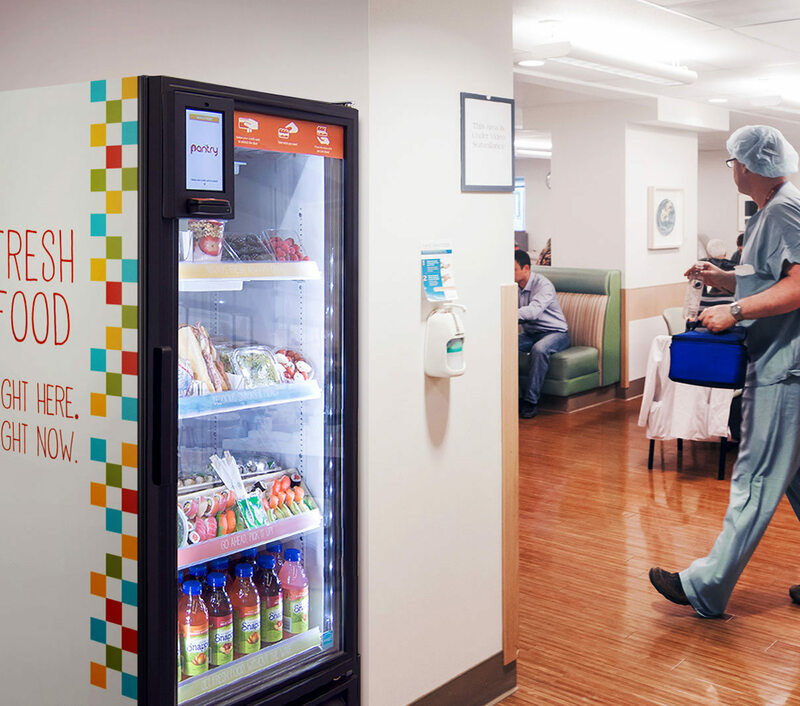 For now, Pantry is focused on selling their technology to food service providers, particularly within workplace and hospital cafeterias. Current customers include Stanford Hospital & Clinics, UCSF Medical Center, Lemnos Labs (hardware startup incubator, previously featured on this blog here and here), and cloud platform provider Akamai. Longer-term, Pantry also sees the promise of incorporating their technology into the home and consumer market. Congrats, Pantry team, on Friday’s business plan competition win! I’m looking forward to witnessing your future growth and development.